Patriots Player Danny Amendola Gushes Over Girlfriend Olivia Culpo: "I'm Lucky to Have Her"
Danny Amendola feels "lucky" to be with girlfriend Olivia Culpo. The Patriots wide receiver opened up about his relationship with his model and actress girlfriend at the Super Bowl Opening Night at the Xcel Energy Center in St. Paul, Minn. on Monday. 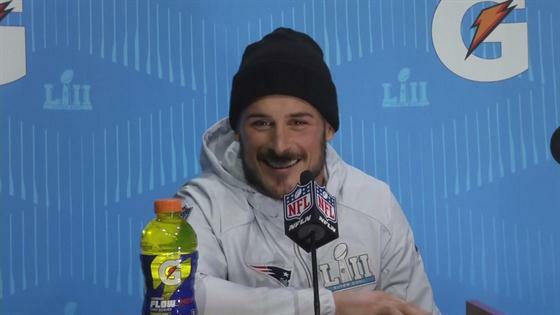 When asked if his teammate Tom Brady and Gisele Bündchen are "worried" about being replaced by a new Pariots "It" couple, Amendola smiled and shared with E! News that there's no competition between the two couples. "It's never been about a competition or anything," he told us on Monday. He then added that Culpo is "a great girl and she's loving." "I'm lucky to have her," he continued. Culpo, who was crowned Miss Universe in 2012, started dating the NFL star in 2016. And she was there to watch the Patriots win the AFC Championship on Jan. 21, sending them to the 2018 Super Bowl this weekend! "BABY GOING TO THE #SUPERBOWL ❤️❤️❤️❤️❤️❤️❤️❤️❤️❤️❤️❤️❤️❤️ #MVP," she captioned a sweet post of the duo sharing a kiss after the win. Take a look at the video above to see Amendola talk about Culpo!